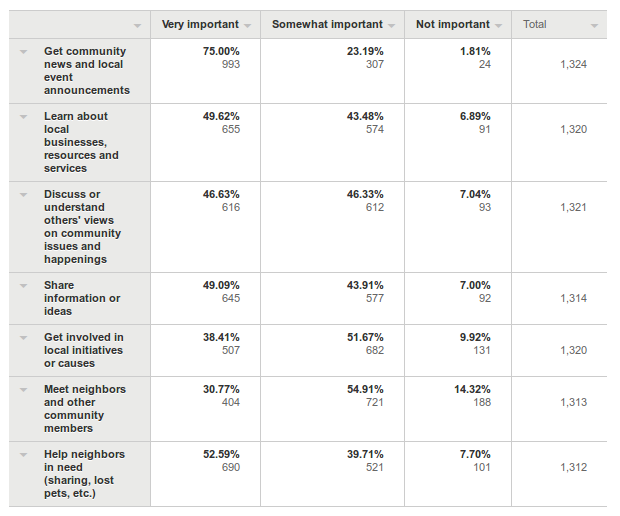 Survey Says – 56% credit their Neighbors Forum for increased community satisfaction and more was written on February 11, 2015 and filed in All, Inclusion, Issues Forums, Lessons, Minneapolis - US, Minnesota, Neighbor Neighbourhoods, News, St. Paul - US, US. While we have more in-depth analysis to do, we wanted to share the top line results from our 1350 respondents. That’s a big pool – about 10% of our individual participants just on our Twin Cities Neighbors Forums (not our city-wide forums or other cities) with active accounts. 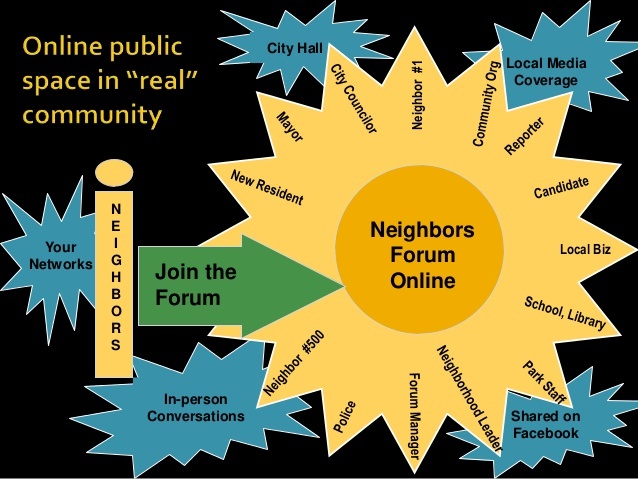 If you are new to E-Democracy and our Neighbors Forums (our BeNeighbors.org project), our online neighborhood spaces (combined email/web forum/social network) connect up to 30% of households ~daily in some areas. 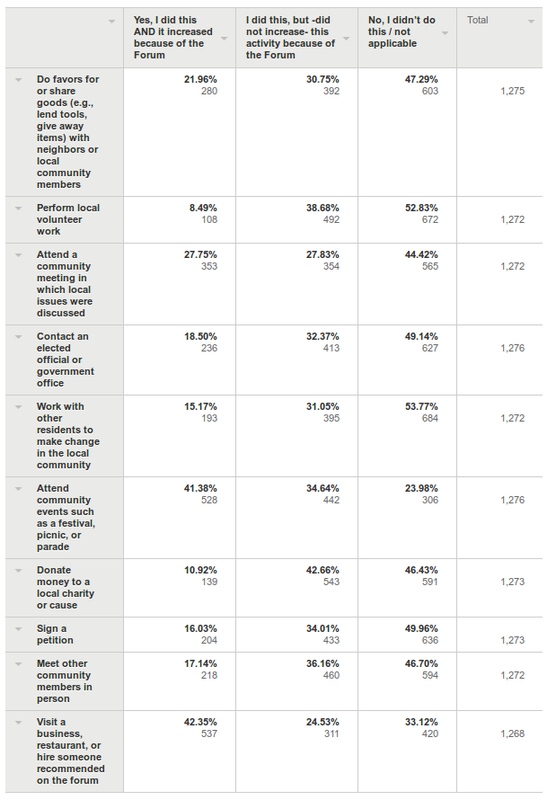 Here are our top line results in PDF and responses comparing Minneapolis and St. Paul forums (PDF) (notable differences) – the answer tables for questions 9-12 are most insightful. The questions PDF might be useful for those creating similar surveys for use elsewhere – we spent nearly two years crafting these based on dozens of surveys we collected and gathered feedback along the way including support from Network Impact who was commissioned by the Knight Foundation to work with a number of leading civic technology projects they had funded. We will add more analysis as it is available here. Here is some useful background on the three year inclusive outreach project which ended with 2014 funding wise. We even received some White House Champions of Change recognition along the way. We used Census data to help target our Saint Paul outreach and our forums use official city neighborhood boundaries which in theory mean Census data can be used in further analysis (we used this data source on neighborhood profiles extensively). We are seeking opportunities to further this extremely unique online inclusive engagement work as part of a research initiative for greater lesson-sharing. Along those lines, our public forum data is generating useful research and leading to academic papers and publications. We are interested in how survey data might be combined with forum data (of course on an anonymous basis) to generate more knowledge on impact and what works. In deeper analysis, we’ve found that increasing community satisfaction is an indicator question where respondents on our four most engaged Minneapolis forums credit their forum far more at 70% for increasing satisfaction. For neighborhoods and cities seeking to attract and retain residents including new talent, fostering online neighborly connections appears to be part of the secret sauce “welcome mat” for great communities. While our funded inclusive outreach makes our network perhaps far more representative than other online civic engagement/online neighborhood efforts, participants are essentially self-selected. 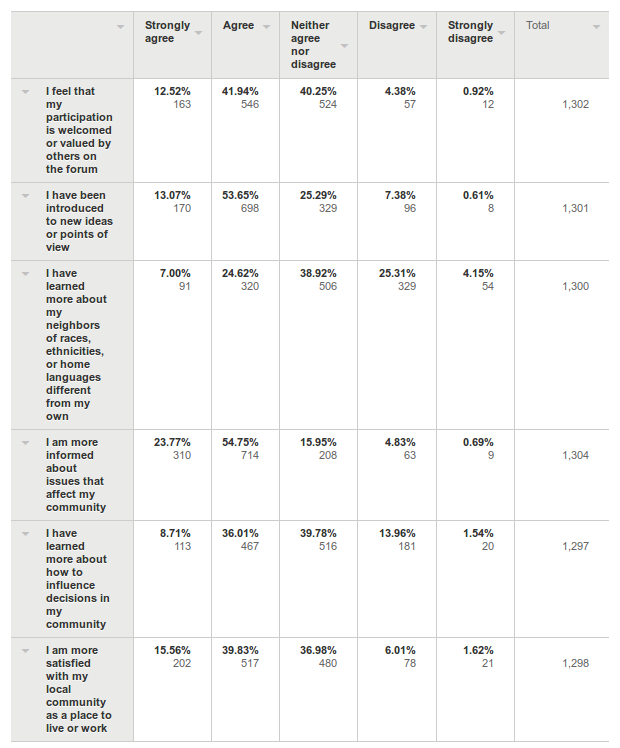 To that end, we are excited to share our rough analysis from the 3,000 respondent Minneapolis Digital Inclusion survey which actually allows us to see our forum’s likely direct impact on the population as a whole. See question 12 for results on what people already did (Neighbors Forums do attract community-spirited people). Separating out those who would have generated social capital anyway without our forum from those who credit the forum with moving the needle on civic engagement is hugely important. Future analysis on the characteristics of forums generating more action will be useful. Future projects that build on these positive outcomes would be exciting the explore. The survey tells us that the more active your forum is the more you are actually satisfied with your community as a place to live. Wow. 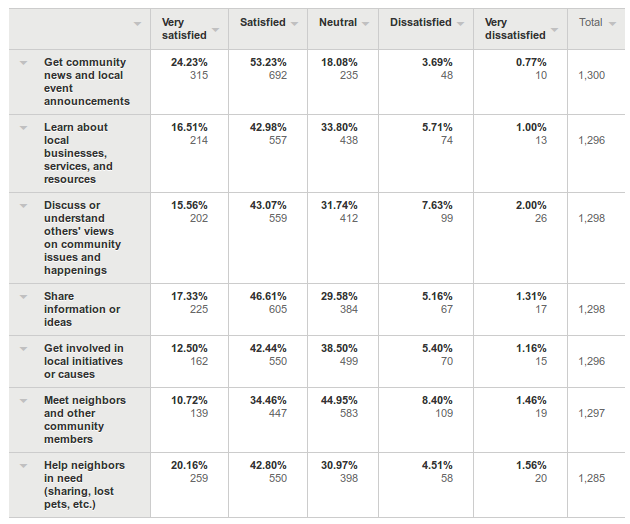 In fact, on our four super active forums in South Minneapolis 70% agreed that because of their forum, they are “more satisfied with my local community as a place to live or work.” On our less active Saint Paul and Minneapolis forums, the average who agree with this came in under 50%. Notably however, those who better represent the diversity of Saint Paul that we signed up at their door reported in with one of the highest percentages strongly agreeing with this statement – more so than all but one of our super active forums! (1) Our South Minneapolis forums became well established a few years earlier before the diffusion of local online spaces like Facebook Groups and NextDoor. These new choices divided neighborhood attention and likely attracted the engagement of people in St. Paul similar to those who naturally flocked to our Minneapolis forums and to this day share community content actively. Participants who share – who post useful content are key to engagement. While not all Neighbors Forums in St. Paul today are more limited one-way community announcement services, two-way community discussions and trust-building community engagement on our strongest Minneapolis forums continues to thrive. Here are someone detailed results. See the full PDF for more including how people learned about their forums specifically. 9. 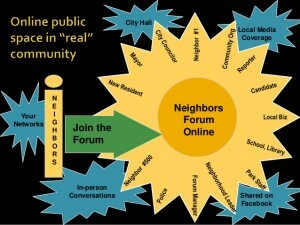 How important to you are the following things you can do on your Neighbors Forum? It will be very interesting to compare Minneapolis and Saint Paul results related to learning about neighbors across diversity. As our field outreach was only funded for St. Paul and our four most active Neighbors Forums are in Minneapolis, to really test this goal new resources to do inclusive outreach in S. Minneapolis would be crucial. It is our experience that location-based neighborhood connecting, particularly on commercial sites, connect wired, wealthier, whiter home owners most easily and that inclusive outreach requires real intent and resources. Being more satisfied with their community as a place to live because of their Neighbors Forum tells a big story about about forum quality. Those one our four “super” forums as noted above were far more likely to give their forum some credit. In forums that are honestly relatively quiet (particularly in areas of St. Paul with competing Facebook Groups or Next Door traction) I our view people were more satisfied than they should have been. If they only knew what they were missing from how our active forums really thrive. This question showed the impact of a strong forum versus those not used on a literally an hourly basis to connect the community. 12. In the last 12 months, did something on your Neighbors Forum lead you to do or increase any of the following? Here are open ended survey responses sorted into theme. Because of this forum my family attended several summer events in the area. Thank you. Events shared are always appreciated and make me feel more involved in my community. Without a neighborhood newspaper the forum has provided basic community happenings, which has improved my sense of community. I think one of the biggest things the Neighbors Forum does is help you when you’re looking for a service. We discovered a new mechanic who we are extremely happy with thanks to the forum. Same goes for our plumber. It’s great to hear the different suggestions and experiences folks have had. Invaluable. As a local business owner, I make an effort to support other local businesses near my own. I try and use the hardware store, gas station, restaurants and other service providers in my neighborhood. I just contacted one person highly recommended for handyman, and discovered he had lived across the street on my block since 1980–the same year we moved here! He’s going to patch our ceiling soon. Our neighbors forum has been celebrating small business in the area. My partner and I are launching our own venture, and it has been so helpful to have community support behind our shop. This has been made possible by the Neighbors Forum, as we meet people that we don’t really “know” but have a mutual affinity for, as they are neighbors, locals who really want us to succeed. I found amazing locally sourced fresh strawberries available the last few autumns by a local farmer only available with E-Democracy. Someone shared CSA options in the neighborhood and I signed up for one and I very much enjoyed it this summer. Finding recommended vendors and service providers has taken the stress out of guessing. Even though not all topics are of interest to me, reading them gives me a better understanding of community perspectives other than my own. I believe this to be a crucial component of an inclusive and diverse community. I did learn a little more about the complexity/differences between long-standing community members and newer residents, differences in perception regarding whose voice is “authentic,” “credible,” “legitimate”. I work for SENA – the neighborhood organization for Standish & Ericsson. The forum has been a very valuable means for us to get information out to a large part of the community. We were able to get the word out about National Night Out and had lots of participation from the neighborhood. Excellent programs and lectures at the library are posted. I have discovered this is a much better resource than expected. A community member on the Forum read one of my library postings about the Library Card Art Contest. She entered her art piece and it was picked as a runner-up! I like when the police liaison and the neighborhood association chime in on discussions. It has made a big difference to me to know about crime in my neighborhood and how connecting with others can make a difference in how we watch for each other. Being informed and aware of what is going on has made me feel safer and more connected. I think in general when someone shares about crime or suspicious activity in the neighborhood it is helpful. Everyone knows to stay more aware and keep their eyes open for things like that. There was a lot of discussion about the Ray Widstrand incident — very heated at times, with opposing voices being heard, albeit not without some hurt feelings. I felt this ongoing discussion was very enlightening because it gave insight into how differently neighbors from the same community saw this and other negative events that occurred around the same time. A few years ago, when the woman was sexually assaulted in Powderhorn Park at gunpoint, with her children present — the way people in the community organized an event and got the word out through the forum was great. We have helped each other be more aware of increases in specific crimes, and helped each other take precautions against them. We’re not in the safest neighborhood, but when we heard gunshots right outside our house, our friend and neighbor was quick to find the police report and post it for everyone. It made me feel a little safer, just that everyone was talking about what happened, not ignoring it or hiding, or becoming too scared. I attended the open forum on crime at the local police station which was advertised in the forum. The tips on how to make your home, garage, and yard more secure were very helpful. I really appreciated the time and effort of the neighborhood crime specialists to share their expertise with the public. It really helped me to understand the rationale behind some decisions being made by our local government. It was nice to hear others opinions, both those that agreed with me and those that did not. When I was an appointed official, it helped me stay connected to the community and plugged into their thoughts/ideas, and what was important. It has been a very useful source for information about candidates running for public office. Powderhorn Park hosted a school board candidate forum which was mainly geared toward the Spanish-speaking community. As a white person, it was fascinating to listen to the stories and hear candidates point of view. The discussions about Ranked Choice Voting in St. Paul allowed us to discuss different opinions on that important subject, including a lot of misconceptions. I enjoy reading others’ take on city matters–what our politicians are doing and the progress or lack thereof in the school district. I like it when people who know the facts of a matter can share those facts and change perceptions and the tone of a discussion. I learned about the city’s Adopt a Trash Container program and got one placed in a garbage-strewn area. It REALLY made a difference! I attended several forums/community meetings because of the Neighbors Forum. I went to a local meeting and learned about the plans for the Snelling and University area. I learned about the Library Love Run and Historic Hamline Village and attended a community meeting. It got me to attend a couple of meetings about biking and bike lanes at the NE Library. I heard about meetings concerning the new co-op that I was able to attend. I heard about – and attended – a crime meeting at Matthews Park. I went to the community meeting at the church next to the Arlington library and got introduced to the Youth Ambassadors. I learned a lot. I was prompted to attend a MPRB meeting about “the yard” and to speak at the meeting. The city parks department was going to tear down a bunch of trees and make a parking lot in our community and the neighborhood forum announced it and organized a group to make our voices heard and we were successful in stopping their actions. We helped to build the new playground at the St. Paul Music Academy. We helped get the co-op built. I volunteered to help spread the word about the Powderhorn365 Kickstarter campaign, and we used the forum extensively. Our direct neighbor was being cited for junk by a new inspector. Everyone on the forum and many others signed a petition and got them to understand it was garden art. It worked. We used the forum to help spread the word about the privatization of a local recreation center and got over 100 people to attend a meeting with officials. This stopped the process and allowed us to set up a community task force to discuss what a partnership would look like. I have been very grateful to the work and efforts of the folks trying to get MAC to listen to our neighborhood concerns about increased air traffic, decibel levels, and noise/air pollution. They have kept us much better informed about studies, meetings, and issues than the local news. There have been discussions about a household hazardous waste site that was going to be placed in the neighborhood and due to a lot more discussion than some local officials expected, it appears such a site will be located in a different and more desirable location than originally proposed. I enjoyed the discussion on the forum about what to do with the old Rainbow store building and brought some of those ideas to the Longfellow Neighborhood Development Committee. I sent an email to the list to explore ways neighbors could work together to make their homes more energy efficient. Several people responded and as a result, a group of us met several times during the year and several homeowners did energy efficiency home improvements. We are continuing this energy efficiency work now through the District 10 Environment Committee. I first learned about some controversial issues (Randolph Ave) in the forum and was able to bring those issues to the MGCC Transportation committee and worked with Ramsey County to provide feedback. Discussions on the forum showed me that I was just as informed on issues as anyone else, so I decided to have more influence on the community by joining the Highland District Council. I was asked to lead a neighborhood history tour (posted on the forum) that led into two free sessions (posted on the forum) for neighbors to learn how to research their houses’ histories at the Hennepin County library. Forty people got to know each other and talk about their houses. Soon I will invite them all (via the forum) to share their research findings at the Hennepin County History Museum. We organized a book reading with a local author at our house. A lot of people from the neighborhood whom we did not previously know came to the event. A big driver for this was the announcement posted to the forum. A lot of neighbors met each other for the first time because of this. I went on a Seward Walk and met a lot of people from the neighborhood while learning some great history and having a hoot! It was a source of networking for my family and me when we first moved into the Powderhorn Neighborhood and did not yet know anyone. We were able to post about ourselves as a family and offer a gathering for other people interested in meeting for social engagements. I like hearing about neighbors who help others and make a difference in the lives of others in my neighborhood. A local neighbor with a lot of history died recently and her funeral was announced on the forum. I believe many more people came than would’ve otherwise. It was a great time to catch up with old friends, meet new ones, and learn some fascinating neighborhood history. One of my friends who is getting older needed some help with heavy things, and he found a young person through the forum who was happy to help him. He didn’t know where else to turn. I used the forum to create a list of those in need of snow shoveling help and those that could offer such help. Last year during a huge storm that downed 100s of large trees in the neighborhood there was an outpouring of email exchanges sharing tools and offering help to residents who were affected. Wonderful to see. I learned how quick neighbors are to help one another in times of need. I am new in the neighborhood and had a bike stolen from my yard. A neighbor told me about the forum and when I posted, I think three people offered to lend me bikes if I needed one. Heartwarming kindness and real neighbors! I offered up some free worms for composting. Two ladies took me up on the offer so I left containers of worms on my porch for them to pick up. Later I got an email from one of the ladies. She had noticed my concrete front steps were falling apart after the brutal winter. She wanted to pay it forward and she offered to fix my steps for free. I agreed but wanted to learn a skill so I joined her. She told me that her neighbor had taught her the simple fix and she was so excited when I wanted to learn the skill, knowing that I could pass it on to others. There was a call for the high school baseball team needing equipment that really stuck with me. I hope there are more requests from good people doing good things who could use more community support. The reuse opportunities have been very valuable. When a neighbor took down a chimney, we were able to salvage them to better our property. They saved on hauling away costs and we saved by not having to purchase landscape materials. I had a friend moving into the neighborhood from another state who was needing support with resources. I was able to help her find items for her home through postings from neighbors who were giving things away. I was able to get a very nice ceiling fan for free because one of my neighbors was giving it away on the forum. I have used the Neighbors forum to connect with other gardeners in the community, and we have shared plants. It’s fun to connect with other gardeners and to learn about gardening from people with actual experience in our neighborhood, and the plants I’ve gotten from them have been much more successful than nursery-grown plants. I had a lawnmower that I wanted to get rid of and was able to give it to a new neighbor because of the forum. I was looking for raspberry bushes and the forum help me find options to transplant from a neighbor. I was able to find a free A/C unit for my daughter’s father for his apartment. The outreach from the forum was enormous and fast! I really enjoy the frequency and timeliness in which people share their ideas/post questions, etc. on this site. I visit every day! I was looking for a Cherry tree branch to graft onto my Cherry tree. I happened to find the exact variety I needed through a neighbor. I was feeling overwhelmed by yard work and hired a youth in response to his mom’s post. Not only was I glad for the help, I enjoyed connecting with the mom and the young man. I was able to get many perennial plants for the teen program I facilitate at a homeless shelter downtown. I have been trying to find a home for Christmas tree that was given to me, and was delighted to pass it along and so relieved to have it out of my house. I love all of the posts about missing pets. Having lost a pet, I understand how hard it can be. Given our technological advances, it pleases me that we go to the forum before sending a rogue pet to the shelter. Very inspiring! We rescued a puppy and needed to fence off our yard quickly. We posted on e-democracy and within 30 minutes a neighbor offered to lend us his posts and wire fencing and we were able to contain the pup immediately and keep her safe until we could put up a more permanent fence. We moved in to this neighborhood in March. I posted about our cat who escaped and many helpful neighbors responded and we got him back! A chicken appeared in our yard and we were able to locate the owner via the forum. I just moved here from out of state, and it has been incredibly helpful to know that there’s a community of people out there working to make this place a more welcoming, equitable, livable place. We are new to the community so having access to the online forum helped us decide if it was the right neighborhood for our family. 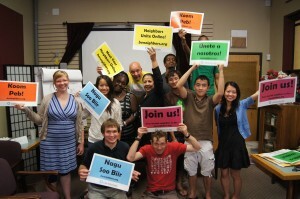 We were able to gauge how involved people are and what they do. We are looking forward to participating in this on a regular basis. I enjoy living in a large city, and the sense of community that the forum provides enhances the experience. I wish the city council leadership and police had actively used the forum to help us understand the discussions. In the last few elections, even the primaries, I didn’t just feel like I was checking off random names on the ballot based on a few lines of political propaganda written by someone’s campaign manager; some of these people had actually engaged with each other over local issues in a forum that wasn’t carefully vetted and scripted, which too few of our candidates for elected office are willing to do these days. It’s really inspiring to see how benevolent the community is. I appreciate reading about people taking animals in, or giving away free stuff, or standing up for things. I just love that it exists. It makes me feel connected to the people in my community.